The Kingdom of Sweden is part of Scandinavia and situated in Northern Europe. It shares borders with Norway and Finland, and has access to Denmark via a bridge-tunnel. Sweden is one of the few countries in Europe with a constitutional monarchy and a parliamentary democracy. 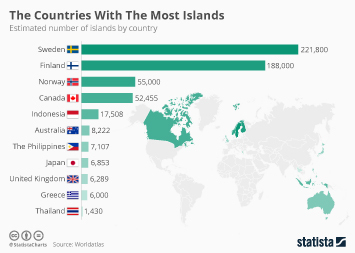 Based on total area, Sweden is the third largest country in Europe - its population density is relatively low, however, and in 2017, it was estimated that only about 10.18 million people lived in Sweden. For comparison, Germany has eight times as many inhabitants. As a result of the slowly increasing life expectancy at birth, the total population in Sweden has been steadily increasing over the past decade, and the country's popularity among immigrants from all over the world also helped increasing population figures. Stockholm is the capital and the largest city by far with a population of over 900 thousand inhabitants. Although Sweden became a member of the European Union in 1995, a referendum decided against the country's membership in the euro area. Thus, the official Swedish currency is still the Swedish krona. Today, Sweden is considered one of the most highly developed societies in the world. The low unemployment, low inflation rate and high wages make Sweden one of the best places in Europe to live and a top destination for asylum seekers and refugees. More than ten percent of the Swedish population is made up of immigrants. One major reason for this fact is surely the Swedish social welfare system, which provides universal health care and post-secondary education for its citizens. Additionally, the Swedish economy is one of the strongest in the world. In 2017, Sweden was among the leading countries in the world with the largest gross domestic product per capita, an important indicator for a country's economic well-being.GDP per capita indicates the strength of the economy and standard of living in a country. In addition, Sweden's gross domestic product is estimated to increase to approximately 640 billion dollars by 2022, a significant increase compared to the 2015 Eurozone Crisis level. Most of Sweden's GDP is generated by the services sector, which includes tourism and hospitality. The trade balance in Sweden has been slightly negative in the last two years for which data are available. This indicates that Sweden is benefitting from a stronger krona against the euro and therefore taking advantage of relatively cheaper imports.